The Philadelphia 76er continue their historic streak. With a 121-116 victory on Tuesday night against the Atlanta Hawks, the 76ers secure their 15th straight win (the longest continuous streak in franchise history). If the Sixers beat the Milwaukee Bucks Wednesday night, they will secure the #3 seed, but if the Cleveland Cavs win and the Sixers lose, the Cavs grab the #3 seed. 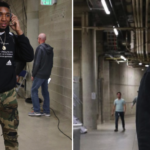 Before the Warriors game, Utah Jazz Donovan Mitchell wore a sweatshirt with the definition of a rookie “an athlete playing his or her first season as a member of a professional sports team” implying the Sixers Ben Simmons (who was drafted in 2016 but didn’t play because of injuries), isn’t technically a rookie. Both are vying for rookie of the year and both are on fire. It only took 10 years, but Andre Ingram got his wish to play in the NBA. At 32 years old, Ingram spent 10 years in the NBA G League (the developmental league for the NBA) and every year held out hope he’d make it to the show. With injuries to some of the Los Angeles Lakers players, Magic Johnson invited Ingram to play in the Lakers’ last two games of the season. As befitting any feel-good story, Ingram not only made his first shot but ended the game with 19 points and received the game ball from coach Luke Walton. Wednesday is the last day of the NBA regular season, and the playoff seeds are on the line. For more on potential playoff matchups, click here.